I've decided to try something new with my blog. There are as many reasons to crave a more organized lifestyle as there are people I find myself working with. Each of those people has certain desires: more time to relax and enjoy their favorite activities, less time searching for things and less stress. Each has certain limitations: physical space to work within, budgets, energy and time. And, most importantly, each has their own personality. I want to occasionally share some of the interesting and unique things we ending up creating together, to help inspire you to do something new in your space. Many people I've worked with through the years are creative people. Artists. Crafters. Scrapbookers. With all of the tasks they'd like to undertake often comes lots of supplies! Yarn, material, beads, glue, paper, tools and so on and so on. Sometimes, it's a box or two. Sometimes, it's a room or two! Working within our limitations of space, time and budgets, we tend to find a great fix for a tricky problem. The problem: rulers. 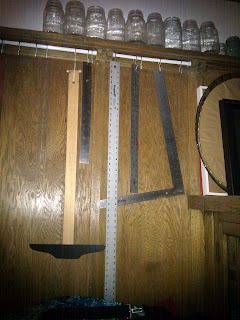 A handful of different sized rulers. Sure, we could stand them up in a jar or canister, but we were lacking floor or counter space to make that happen comfortably. What we did have was plenty of wall space (remember: always go up)! The solution: Within the molding of the wall, there were areas of ornamentation that stuck out further than the rest of the wood. Inside those indentations, were snugly nestled small extension rods with "S" hooks on them. 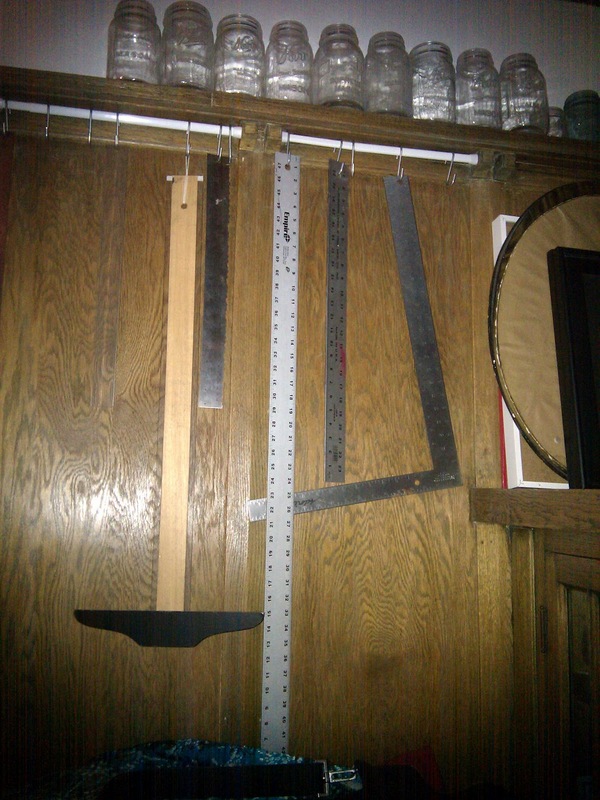 Now, all those odd shaped rulers have a great place to hang - out of the way and off the floor! What was your great idea to organize something?